Located across the road from Leuralla, this escarpment garden is accessible to the public. Join statues of Boofhead and Olive Oyl as they gaze out at the breathtaking view. 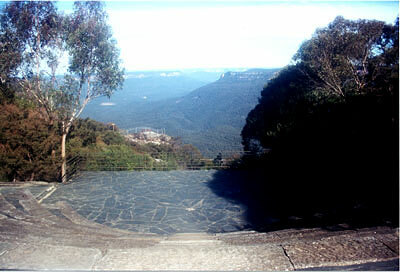 This is the only remaining cliff-top lawn area with valley views in Leura that can be accessed by visitors. Spectacular amphitheatre available for hire. Excellent outdoor venue for weddings, or musical and dramatic entertainment. Terraces & lawn approximately 1000. The photo below, taken on a winter afternoon, faces south. Midday sun is behind the photographer. Spectacular view of the Jamison Valley and Mt Solitary. The site has a long history of entertainment use. In the early 1900's, the owner constructed rough bush stone terracing in the form of an amphitheatre to take advantage of the remarkable valley views. In 1985, this simple stone work was rediscovered by the owners. Inspired by a natural theatre in the Schweiz Saxony region of Eastern Germany the amphitheatre was restored for chamber music, opera and other performances. Restoration work took place in 1986. Since then it has staged Shakespeare in the Park, Greek plays, a yearly dawn Easter morning service and musical performances. Rodger Woodward, one of the most gifted pianists, described this place as "one of the most spectacular external performance venues in the world". Inquiries for use of the amphitheatre are welcome.